Villagers in tambon Sa-iab have revived their protest against the Kaeng Sua Ten dam by holding a black magic ritual to curse Prime Minister Samak Sundaravej, who has revived the controversial project. More than 500 villagers joined the ritual held by the Yom river in Song district, on which the dam is to be erected. They burned an effigy of Mr Samak and sprinkled its ash on the river while putting curses on him. The prime minister announced his support for the dam on World Environment Day earlier this month. The tambon Sa-iab villagers are known for their fierce protests against the project, as they have managed to thwart it for 19 years. ''We will not cooperate with any campaigns for the dam and will not guarantee the safety of officials who work for the project,'' villagers' representative Sudarat Chaimongkon said in a statement. The government and the villagers disagree on the value of teak forest in and near the Mae Yom National Park. Mr Samak believes there is only a degraded forest, while the villagers say he is lying. The teak forest is at the centre of debate because, according to environmental activist Harnnarong Yaowalert, 25,000 rai of forest in the national park will be flooded if the dam is built. The ritual yesterday marked the villagers' first move to revive their demonstration. They vowed to do all they could to protect the forest. The villagers also held an ''ordination ceremony'' for the forest. 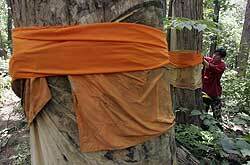 Trees with monks' robes around them often survive getting cut down as poachers perceive them as sacred objects. The government says the Kaeng Sua Ten dam would provide a solution to floods and drought.